Discover the main sections of our practices, here at Laer-Eye Clinic. Keratoconus is usually discovered during routine examinations at the opticians. It is a fairly uncommon condition that affects the cornea – the transparent window at the front of the eye. Due to its smoothly curved shape, the healthy cornea acts as a powerful lens bringing rays of light into focus on the retina at the back of the eye. However, in keratoconus the cornea becomes progressively steep and cone-shaped, causing myopia (short sight) and, if the steepening is uneven, also astigmatism (distortion of vision). It is not known what causes the disease but there is a strong genetic element, so it may sometimes run in a family. How does C3-R for Keratoconus work? The bulk of the cornea is made from collagen fibres which are arranged in bundles. The strength and rigidity of the cornea is partly determined by how strongly the fibres are linked together. Over the course of a lifetime the cornea becomes progressively stiffer due to natural cross-linking between the fibres. Riboflavin (vitamin B2) is a naturally occurring compound which strongly absorbs UV light. 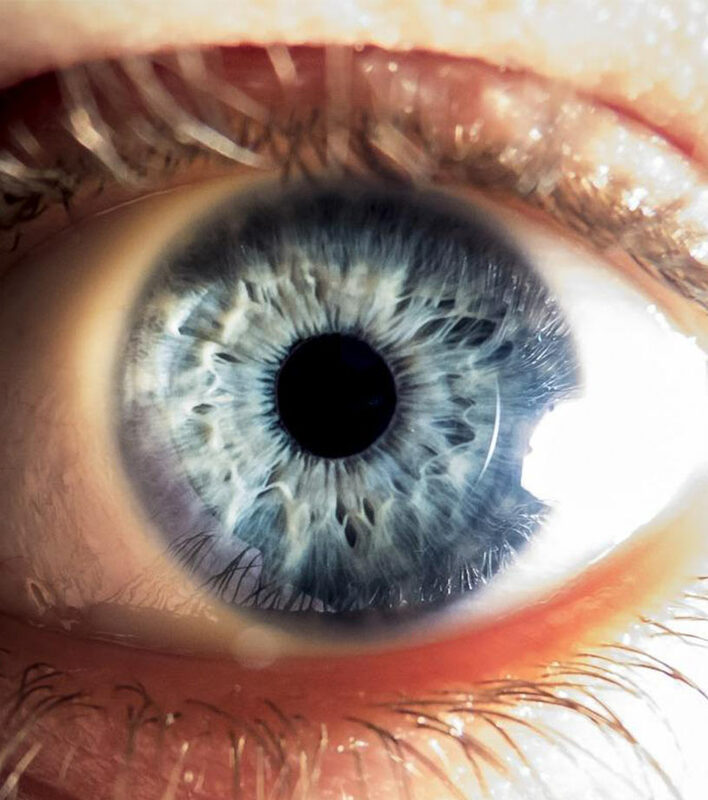 By applying riboflavin to the cornea at the same time as exposing it to a UV light source, the riboflavin not only enhances the cross-linking effect of the UV light, but also absorbs the light to an extent that the inner layers of the cornea and intra-ocular structures are protected from the potentially damaging effects of the light rays. C3-R for keratoconus seems effective in stabilising progressive ectasia, and in some patients the treatment gives an additional small measure of benefit in the reduction of corneal steepness and irregularity. This in turn means some reduction in the myopia and astigmatism associated with the ectasia. In the past it was always considered that excimer laser eye surgery correction of myopia or astigmatism was not possible when ectasia was present. This was because by removing corneal tissue with the laser the cornea would become even less stable and the ectasia would be made worse. However, once the Keratoconus condition is stabilised by C3-R it may be possible to perform limited amounts of laser eye surgery whilst still maintaining structural stability of the cornea. Such laser eye surgery treatment would usually be aimed at restoring a more spherical shape to the cornea (custom ablation). Any remaining optical defect could then potentially be corrected by spectacles, or alternatively with soft contact lenses, or by phakic intra-ocular lens implants. UV light is known to be damaging to cells, and the keratoconus treatment causes the stromal cells (keratocytes) in the outer layers of the treated parts of the cornea to die. However, these cells are replaced by new keratocytes which migrate from untreated parts of the cornea into the central area over a period of some months after the keratoconus C3-R treatment. In theory the UV light could be damaging to the inner endothelial cell layer of the cornea, and this is why the corneal thickness needs to be at least 350 microns if a standard keratoconus C3-R treatment is to be undertaken. In clinical studies carried out so far, no evidence of damage to the endothelial cell layer has been documented. Although UV is potentially damaging to the lens and retina, it is believed that the riboflavin blocks the UV transmission to an extent that no measurable damage will occur. At present the long term effects of the keratoconus treatment are unknown. How is Keratoconus C3-R treatment given? The keratoconus C3-R treatment is carried out with topical anaesthesia (eye drops). The surface epithelial cell layer is removed from the central part of the cornea, and the riboflavin drops applied. Once the riboflavin has penetrated well into the eye, the UV light is focused onto the central area of the cornea for 30 minutes. Finally a bandage soft contact lens is applied. The contact lens is worn for three or four days until the surface epithelial cell layer has re-grown. During the first few days the eye will be sore and watery. Sometimes there is slight haziness under the epithelial layer for the first few months after treatment, but the vision stabilizes within a month or so of the treatment. C3-R is a registered trademark of Boxer Wachler Vision Institute. An alternative treatment for Keratoconus is the use of Intacs, implanted into the cornea. Intacs are a new surgical treatment for mild to moderate keratoconus. When inserted into the cornea, the Intacs segments make the central corneal profile flatter and more regular, and this reduces the optical defect. Intacs for keratoconus are ‘C’ shaped segments of perspex (polymethyl-methacrylate or PMMA), that are inserted deep into the corneal stroma. They were originally designed for treatment of low myopia, and typically correct two or three dioptres of myopia or myopic astigmatism. Patients with keratoconus often have moderate or high degrees of myopia and astigmatism due to irregular steepening of the cornea caused by the condition. For these patients, Intacs for keratoconus will reduce the optical defect in the eye and the remaining myopia and astigmatism can then be corrected either with glasses, or by insertion of an Implantable Contact Lens (ICL), or by Artisan lens surgery. A two millimetre incision is made into the cornea to a depth of about two thirds of its thickness, and a special instrument is then used to prepare the bed into which the Intacs for keratoconus are inserted. Once they have been put into position, a single stitch is used to close the small corneal wound. Eye drops are used for a few weeks to settle the eye down, but the patient can resume normal activities more or less straight away. The corneal suture is removed after a couple of weeks with application of anaesthetic eye drops. Insertion of Intacs is a relatively quick and simple surgical procedure compared to the other operations for keratoconus such as epikeratoplasty, or deep anterior lamellar keratoplasty (DALK). For those who do not wish to have a corneal transplant, it offers an alternative approach for correction of their optical defect. By making the shape of the cornea more regular, Intacs for keratoconus can potentially improve the quality of vision that can be obtained when wearing a spectacle correction. Intacs typically only partially correct the optical defect present in a patient suffering from keratoconus, so additional optical aids or surgical intervention may be required to obtain a full visual correction. Sometimes the quality of vision obtained after Intacs surgery is not as good as that obtained before the surgery. In keratoconus the cornea is thin, so there is some risk of corneal perforation at the time of surgery. If this happens, insertion of the Intacs would have to be abandoned on that occasion, although it may be possible to attempt the surgery again at a later date. Rarely, Intacs that have been successfully inserted may migrate through the cornea and extrude through the corneal surface, in which case they would need to be removed. As with any surgical procedure, there is a potential for complications from infection or inflammation in the cornea, which might necessitate removal of the implants. Because Intacs insertion is a relatively new procedure, the long-term outcomes are not known. Cosmetic Opthalmology can “turn back time” by reducing the appearance of wrinkles and lines, sun damage and sagging skin that can make your eyes look angry, sad or tired. Glaucoma is an eye disorder that causes damage to the optic nerve that carries information from the eye to the brain. Glaucoma usually has few or no initial symptoms. Refractive surgery includes an array of modern surgical procedures designed to improve vision problems, often eliminating the need for corrective lenses.